Victoria Bowling Club » Well done Nic! You are here: Home » Blog » Competitions » Well done Nic! A member of this year’s under 18 Trans Tasman team, Nicole Toomey (Victoria) won the women’s Plate trophy at the Kittyhawks National Under 20 Singles at the Pakuranga club in Auckland last weekend on the back of the international event and the Challenge Trophy earlier in the month. It was a schedule that took its toll on Toomey, but also allowed her to show why she was chosen to represent her country. “I struggled in the first couple of days, but came out fighting on the last day,” Toomey (18) said. This year’s Plate champion defeated Caitlin Thomson (Hokowhitu) in straight sets, 14-4, 8-3. 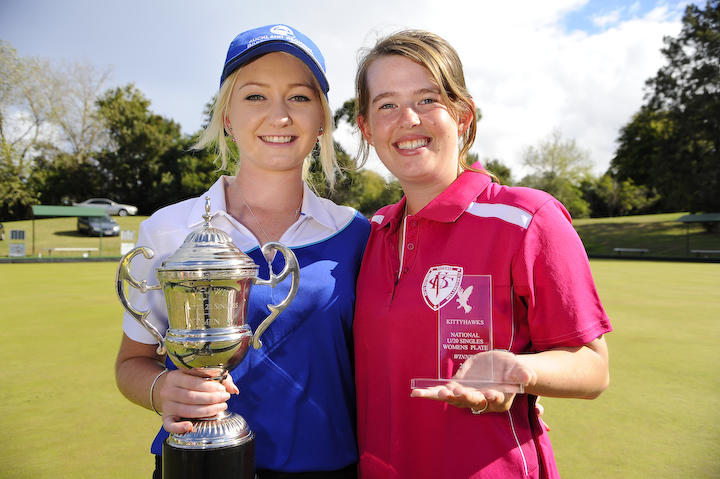 Nicole is pictured with the Main Event winner Selina Goddard (Carlton Cornwall).